Office クライアントに新しい機能を追加する - Office に外部データを取り込む、Office ドキュメントを自動化する、サード パーティの機能を Office クライアントで公開する、などがあります。たとえば、Microsoft Graph API を使用して、生産性の向上につながるデータに接続します。Add new functionality to Office clients - Bring external data into Office, automate Office documents, expose third-party functionality in Office clients, and more. For example, use Microsoft Graph API to connect to data that drives productivity. Office ドキュメントに埋め込み可能な充実した対話型のオブジェクトを新しく作成する - マップやグラフ、ユーザーが自分の Excel スプレッドシートや PowerPoint プレゼンテーションに追加できる対話型の視覚化などを埋め込みます。Create new rich, interactive objects that can be embedded in Office documents - Embed maps, charts, and interactive visualizations that users can add to their own Excel spreadsheets and PowerPoint presentations. Office アドインが COM アドインおよび VSTO アドインと異なる点How are Office Add-ins different from COM and VSTO add-ins? クロスプラットフォーム サポート。Office アドインは、Windows 用、Mac 用、iOS 用の Office と、Office Online で実行できます。Cross-platform support. Office Add-ins run in Office for Windows, Mac, iOS, and Office Online. 一元展開と配布。管理者は、組織全体に Office アドインを一元的に展開できます。Centralized deployment and distribution. Admins can deploy Office Add-ins centrally across an organization. AppSource を経由した簡単なアクセス。AppSource に提出することで、広範な対象ユーザーにソリューションを公開できます。Easy access via AppSource. You can make your solution available to a broad audience by submitting it to AppSource. 標準の Web テクノロジに基づいている。任意のライブラリを使用して、Office アドインを構築することができます。Based on standard web technology. You can use any library you like to build Office Add-ins. 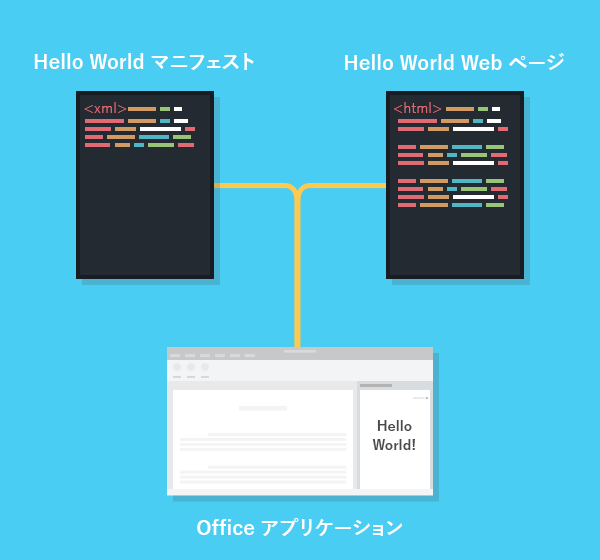 Office アドインには、2 つの基本的なコンポーネントが含まれています。XML マニフェスト ファイルと独自の Web アプリケーションです。マニフェストは、アドインを Office クライアントと統合する方法など、さまざまな設定を定義します。Web アプリケーションは Web サーバーか、Microsoft Azure などの Web ホスティング サービスでホストされる必要があります。An Office Add-in includes two basic components: an XML manifest file, and your own web application. The manifest defines various settings, including how your add-in integrates with Office clients. Your web application needs to be hosted on a web server, or web hosting service, such as Microsoft Azure. アドインの表示名、説明、ID、バージョン、および既定のロケール。The add-in's display name, description, ID, version, and default locale. 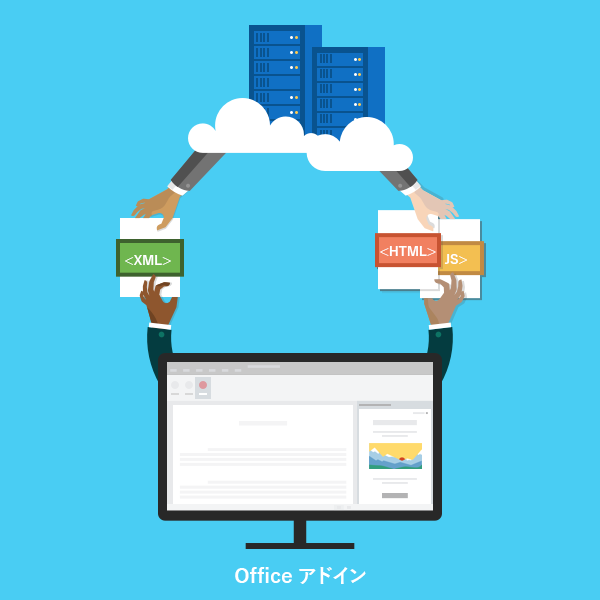 Office とアドインを統合する方法。How the add-in integrates with Office. アドインのアクセス許可レベルとデータ アクセスの要件。The permission level and data access requirements for the add-in. カスタムの UI と作業ウィンドウは、アドイン マニフェストで指定されます。Custom UI and task panes are specified in the add-in manifest. ユーザーがソリューションと対話できるようにするために、アドイン コマンドに加えて、作業ウィンドウを使用できます。アドイン コマンド (Office 2013 および Office for iPad) をサポートしていないクライアントは、アドインを作業ウィンドウとして実行します。ユーザーは [挿入] タブの [アドイン] ボタンを使用して、作業ウィンドウのアドインを起動します。You can use task panes in addition to add-in commands to enable users to interact with your solution. Clients that do not support add-in commands (Office 2013 and Office for iPad) run your add-in as a task pane. 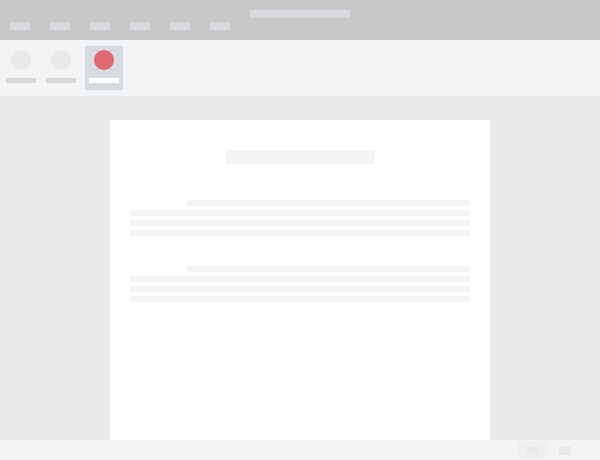 Users launch task pane add-ins via the My Add-ins button on the Insert tab. Outlook アドインは Office のリボンを拡張したり、コンテキストに応じて表示または作成時に Outlook アイテムの隣に表示したりすることもできます。ユーザーが受信した項目を表示するか、返信または新しい項目を作成している場合には、電子メールメッセージ、会議出席依頼、会議の返信、会議の取り消し、または予定を操作できます。Outlook add-ins can extend the Office ribbon and also display contextually next to an Outlook item when you're viewing or composing it. They can work with an email message, meeting request, meeting response, meeting cancellation, or appointment when a user is viewing a received item or replying or creating a new item. Outlook アドインでは、アドレスや追跡 ID などのアイテムからコンテキスト情報にアクセスし、そのデータを使用してサーバー上の追加情報や Web サービスから魅力的なユーザー エクスペリエンスを作成することができます。Outlook アドインはほとんどの場合、Outlook、Outlook for Mac、Outlook Web App、デバイス用 Outlook Web App などのさまざまなサポートしているホスト アプリケーションで変更なしで実行でき、デスクトップ、Web、およびタブレットとモバイル デバイスでシームレスな操作を提供します。Outlook add-ins can access contextual information from the item, such as an address or tracking ID, and then use that data to access additional information on the server and from web services to create compelling user experiences. In most cases, an Outlook add-in runs without modification on the various supporting host applications, including Outlook, Outlook for Mac, Outlook Web App, and Outlook Web App for devices, to provide a seamless experience on the desktop, web, and tablet and mobile devices. Outlook アドインの概要については、「Outlook アドインの概要」を参照してください。For an overview of Outlook add-ins, see Outlook add-ins overview. 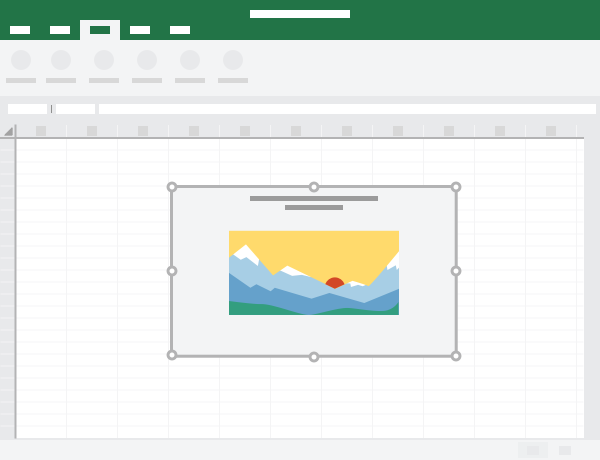 Excel および PowerPoint のドキュメント内に、コンテンツ アドインと呼ばれる Web ベースのオブジェクトを埋め込むことができます。コンテンツ アドインにより、ユーザーは充実した Web ベースのデータの可視化、埋め込まれたメディア (YouTube ビデオ プレーヤーや画像ギャラリーなど)、およびその他の外部コンテンツを統合できます。You can embed web-based objects called content add-ins within Excel and PowerPoint documents. 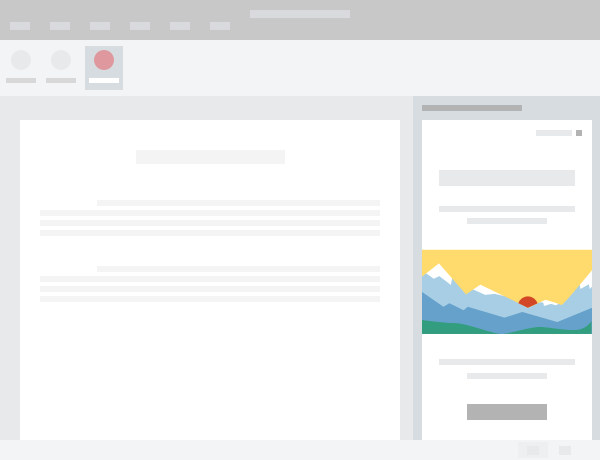 With content add-ins, you can integrate rich, web-based data visualizations, media (such as a YouTube video player or a picture gallery), and other external content. Office アドインの構築を開始する方法の詳細については、「5 分クイック スタート」をお試しください。To learn more about how to start building your Office Add-in, try out our 5-minute Quick Starts. Visual Studio またはその他の任意のエディターを使用すると、すぐにアドインの構築を開始できます。You can start building add-ins right away using Visual Studio or any other editor. 効果的で魅力的なユーザー エクスペリエンスを作成するソリューションの計画を始めるには、Office アドインの設計のガイドラインとベスト プラクティスの理解を深めてください。To start planning solutions that create effective and compelling user experiences, get familiar with the design guidelines and best practices for Office Add-ins.